Melissa Pepling, associate professor of biology in the College of Arts and Sciences, has received a major grant award from the National Institutes of Health (NIH) for her ongoing work in ovarian biology. She is the recipient of a three-year, $440,000 award from the NIH’s Academic Research Enhancement Award (AREA) Program. Also known as an AREA R15 award, it is designed to support meritorious research, expose students to laboratory research and strengthen the research environment of the University. 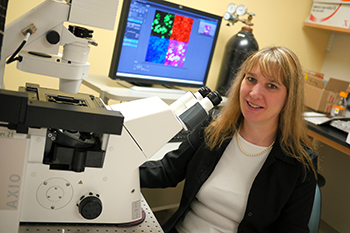 Also a faculty member of the Syracuse Biomaterials Institute, Pepling says the grant award will support the study of other areas of female fertility, including primary ovarian insufficiency, the reproductive lifespan and menopause. As such, her research utilizes a variety of biomedical research techniques, including immunocytochemistry; confocal microscopy; Western blotting; ovary organ culture; pharmacological inhibitors; small-interfering RNA, or siRNA, technologies; and genetics. Pepling holds a variety of other academic and administrative posts, including serving as director of the biology department’s curriculum committee and confocal microscope facility. A sought-after lecturer and contributing journalist, she is a peer reviewer for a number of scholarly publications, including Development, Endocrinology and Nature Genetics. She earned a Ph.D. from SUNY Stony Brook.